Dallas drivers ought to be concerned about wheel alignments for two primary reasons: safety and money. 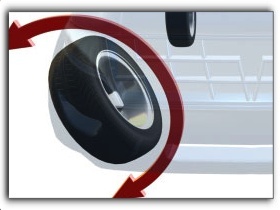 When your wheels are out of alignment, they can pull to one side, maybe pretty hard. A moment of inattention could put you into on-coming traffic or off the road. And a bad alignment will chew up your tires very quickly while driving on TX freeways and surface streets. We had one guy at Compton Automotive who said his minivan wheels were a little out of alignment before a family vacation, but he didn’t think it was that bad so he didn’t take care of it before he left. A couple days and a thousand miles later his front tires were worn down to the cords. He had to take a half day out of his mountain vacation to find a town big enough to have a tire center for replacements. All four wheels are supposed to be lined up and point in the same direction. Sometimes one or more goes out of alignment and is pulling against the rest of the team. In addition to excessive tire wear, this also hurts fuel economy. Part of the alignment service at Compton Automotive is an inspection of the steering and suspension components. Whatever caused the wheels to be knocked out of alignment in the first place may have also damaged important parts. So we want to be sure to replace broken or bent parts as needed. The process corrects alignment of each wheel along three axes: toe, camber and caster, as well as front to rear alignment. Your minivan owner’s manual may have a recommendation for how often alignment should be checked. If not, ask your cheerful Compton Automotive service advisor. Here are some things to look for that should get you in for an alignment check right away: Your minivan is pulling to one side, your steering wheel isn’t centered, you feel a vibration at speed or you see unusual tire wear. In addition to wheel alignments, we perform brake service and power steering service. Give us a call.